Here on Sycamore Hill, we love audio dramas. It probably stems from my own childhood memories of living without a TV. There I’d be sprawled out on my back in the middle of the living room floor, listening to Children’s Bible Hour on the radio and watching the ceiling fan go ‘round. I can still “see” many of the dramas that played out over the waves just as I “saw” them in my mind’s eye way back then. Nowadays we don’t listen to the radio much but we have plenty of options via CD, mp3, and internet streaming. My kids especially love to listen to audio books and audio dramas as bedtime stories to help them wind down and prepare for sleep. 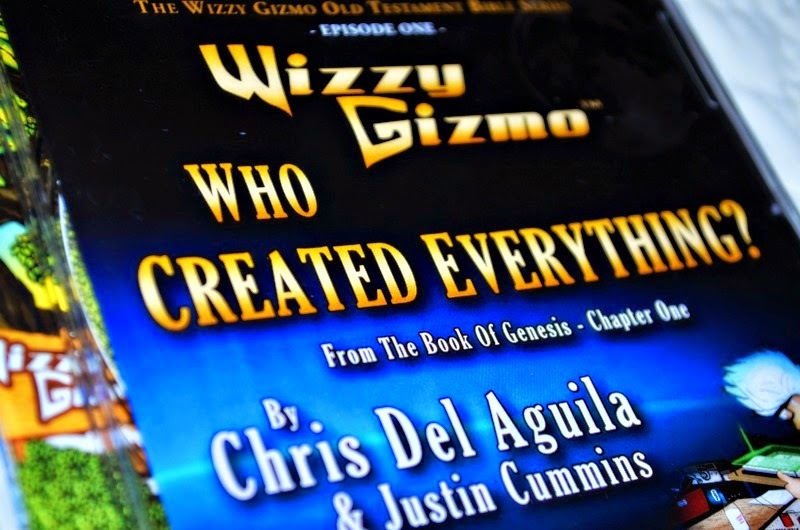 So when we received Who Created Everything? 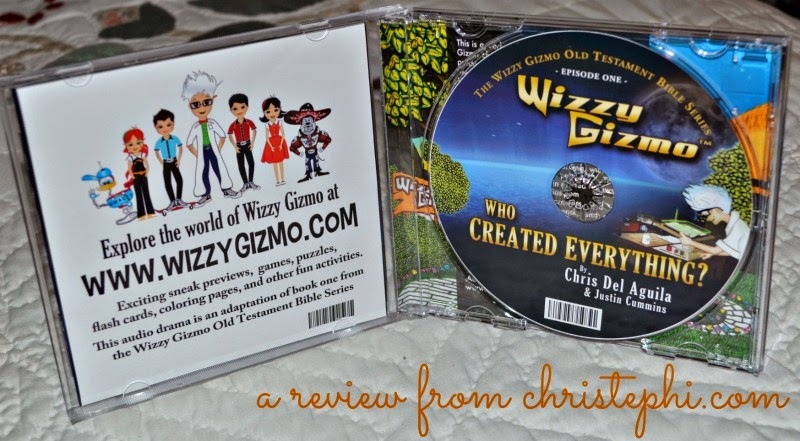 from Wizzy Gizmo to review, we were ecstatic! Who Created Everything? is a 36 minute audio drama about the events found in the first chapter of Genesis. Professor Wizzy Gizmo puts the Bible on his Gizmovision machine and before you know it the adventure begins! The first time I put it on, it started up automatically while I was in the other room. I had sent Little Guy in for a nap and when I came back in to put him down, he was listening to it. His eyes were wide and he said in a very quiet, serious voice, "Mom. I like this." Who Created Everything? is available here as a CD + Digital Download for $14.99 or as a Digital Download only for $9.99. Wizzy Gizmo as a company desires to put tools in the hands of parents that will allow them to implement the teaching of Deuteronomy 6:5-7 into practice in their own homes. They seek to create quality art without sacrificing solid Biblical teaching. "We set our sights on creating content equal in quality to the BIG name companies, with a commitment to communicate the truths of God's Word in the process." Audio dramas based on Scripture are one excellent tool to bring discussion and learning to many your everyday activities. We like to listen to Who Created Everything? on long car rides (none of us are able to read in the car without getting queasy, so audio dramas are an excellent alternative! ), while tidying up the house, and as a good way to wind down after a busy day. Miss M has been particularly taken by Who Created Everything? She said, "I actually thought that they were going through a time machine, but it wasn’t a time machine...you can basically see, touch, feel and smell all the stuff that’s in it. It’s really cool! "There were two songs or three in it. I like that. At the end there’s basically a sound track with all the music playing in the background." "I like the duck [Qwacky]. He sings funny rap songs sometimes. And he tells the kids what words mean. He’s a talking mechanical duck, like a walking dictionary." 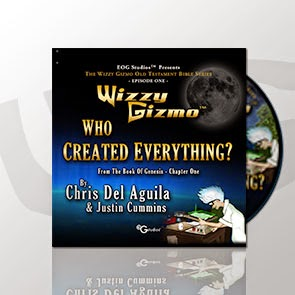 Wizzy Gizmo has other products besides the audio drama including a book of Who Created Everything? and some really cool sets of Fast Track Bible cards that tell the summary and key bits about every book in the New Testament. You can read reviews of many of these other products from my Home & School Mosaics teammates.